It's the first Friday of the month and today's the day I bring you a fun themed craft to share at Bring On the Crafts Blog Hop! The theme for this month is Flowers! Flowers are blooming all over! What a great way to celebrate Spring and Easter too by painting and creating a checkered plaid egg adorned with delicate pansy flowers! How cute and trendy is this! And plaids and checks continue to be quite popular these days! But flowers always add a special touch to just about anything! Let's get started with a plain wooden cut-out egg that I found at the Dollar Tree! Paint on a base color of a multi-surface acrylic craft paint like this pretty Heather color! Next, find the center or middle of the egg and place the first strip of 1/2" painter's tape down on the egg. Smooth out the tape flat so no paint will seep under. Then place another piece of tape right next to it. This is what's called a temporary spacer tape. You can place it down on either the right or left side. The space filler tape provides a guide for making sure the next painter's tape lines are placed down straight and evenly spaced. Put down a third piece of tape next to the spacer piece. Then remove the spacer tape. Continue placing a spacer tape down and placing a new tape next to it, removing the spacer tape, etc. until the egg area is completely covered with painter's tape. Be sure to smooth out the edges of all the painter's tape. Once all the painter's tapes are in place, begin painting the area not covered by the tapes. Lightly use a sponge dabber to cover this area.I painted on the color Eggplant for this. Once the area is painted, remove the painter's tapes and let dry. For the horizontal stripes - like before - find the center of the egg and begin laying down the first strip of painter's tape. Use the spacer tape next for tape placement and then a strip of painter's tape, etc. the same as before with the vertical painter's tapes. Continue adding painter's tape with a spacer next, then another painter's tape, etc. until the egg is covered again with painter's tape. Be sure to smooth down all the edges of the painter's tapes, as before. Once all the tapes are down and smoothed out, dab paint on the open areas. I used the Eggplant color again for a checkered look. Next, I removed the painter's tapes and thought the egg was too dark. (Sorry, I didn't take a picture of this) So, I tried putting painter's tape back on following the previous painted stripes. And painted the open areas using a lighter color called Light Lavender. I needed to apply two coats of this to cover. Now after removing all the tapes, it looks so much better! But obviously, I didn't quite lay the tape exactly over some of the lines. Do you notice the variations? Looks like a new look for lines, huh? Sorta like a houndstooth design! A mishap that I'm really loving!!!! But probably will never be able to re-create again! Lol! And finally, remove the stems from pretty faux pansies leaving the petals intact and glue them on to enhance the look of the egg and to make it look extra pretty! Yes, flowers are blooming all over! On the first Friday of each month, a group of DIY and crafty bloggers join forces. 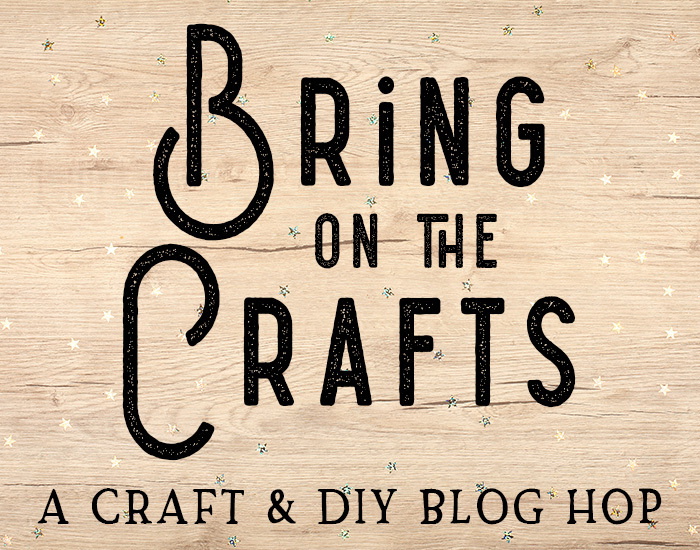 Together with hosts Marie from The Inspiration Vault and Habiba from Craftify My Love, they bring you the #BringontheCrafts blog hop. Each blogger creates a fun craft or DIY project to share that follows a monthly materials theme. April's theme is Flowers! Each blogger chooses their own craft to make as long as they love it and it uses Flowers in the project. Join in on the fun! If you'd like to participate next month, you can request to join our Bring on the Crafts Facebook Group. Next month's theme is Stamps! Your painting design looks amazing! I can't stop looking at it, what a beautiful mistake. The florals look amazing on the egg, very pretty door hanger. The door hanger is so pretty Gail. Cute story about your painting. Sometimes mistakes lead to something fabulous! I fixed your Facebook link. Happy weekend. Stunning in the purples. It is a very good looking piece. Pinned to my Easter board too. Your signature purple color looks great for your checkered egg, Gail. The florals are lovely, too. This is super sweet and very festive. It’s perfect for your door. I've done rounds but never an oval! Love how this turned out--perfect for Easter! Oh Gail this is SOOOOO cute!!! The 3D pansies are such a fabulous touch! I tried to link up but it said my website had been blocked? I knew this was yours, Gail, as soon as I saw it at the Over The Moon Party. LOVE this creative egg idea for Easter! The Spring flowers on the bottom is the icing on the cake. Wow that turned out amazing. You have so much patience! I love that effect; I truly thought you had woven something together to get that background. Pinned. This is beautiful! I love the painting technique you used with the tape. Such a great idea! Congrats, you are being featured at Over The Moon Linky Party. Such a cute idea, Gail! Would love for you to come and link-up at Homestyle Gathering via My Wee Abode each Tuesday!